In this posts I will be looking into the 1977 film series Roots, and its implications in the realm of human trafficking. I will explore why it is important to use the language of trafficking when referring to the African slave trade. The power structure involved, then and now. As well as what is modern day slavery and how parts of it should be seen in the realm of trafficking. Roots, is a mini series depicting slavery in the 1760’s and onward. The series follows one Kunta Kinte, a man who was stolen by colonists from his country in Africa to be brought to the United States to be sold into forced labor. As the series progresses it goes on to show how he and his future generations survive in the US and adapt during and after the Civil war. With Kunta trying to escape and maintain his identity throughout. This series was pivotal in its time, as well as now, as it shows the brutality of slavery that most Americans prefer to not discuss. But what does it have to do with Human trafficking? What connections that are not made is that slavery, was human trafficking. Human trafficking is defined by: the Act (what is done, in this case the abduction and transportation of millions of African people against their will), the Means (how it’s done, slaves were beaten, abused mentally and physically, had body parts removed, as well as more), and the Purpose (why it was done, broadly thought of as forced labor, but other forms of exploitation occurred in abundance). In the film series all the criteria is met to show that this was trafficking even if the language is not used to describe it as such. Kunta is abducted and transported, forced to work, and when he’d try to escape he would be beaten, he had toes removed, and all this was to exploit him as well as his fellows. So why is it important to address it as trafficking? Language matters, and if we can see slavery as trafficking we can see trafficking in a different light. Knowing that the definition of human trafficking describes slavery matters because we already see slavery as wrong, that it happened to millions of people, not just women (as is the norm with ideas of trafficking), but everyone could have been put in shackles, men, women, and children were taken and sold. We can see a film series such as Roots and recognize that this is bad, there was no one thing they could have done to save themselves. But also, much of white Americans took part in trafficking. They of whom who owned slaves or at the very least agreed with it and help facilitate slavery by turning in runaways. When we see trafficking we too know its wrong, but it seems like some truly bad immoral individuals who are doing this, but certainly not the government. And the people who are trafficked are usually women, or weak individuals, but not a entire subset of people. Not an entire culture. This series is so important due to the fact that it was shown to most African Americans in the 80’s and 90’s. Parents would make their children watch them, teachers would show them in schools. It is important to knowing where one came from (no matter your ethnicity), and how this country was built on the backs of human slaves. It can benefit the conversation on both sides to call slavery human trafficking. The human trafficking side gets this viewpoint that shows that you don’t have to be weak to be trafficked and that even the system can take part in trafficking. With slavery showing that this is trafficking, the system did this can start a new side of conversation and saying “hey this falls into this category too” can help shed light on the powers that be and maybe finally make a change. Right now slavery is just seen as slavery, something in the past that is of no consequence to the now. However that’s not the case, slavery is very much a problem today. During colonialism colonizers believed they needed slave labor to create the “new world”. The people of color that were abducted were not seen as people but as animals, partially human, savages whose life was worthless. They brainwashed the slaves, kept them uneducated, transported them in shackles, punished them severely if they tried to escape. They made sure this kept them at the bottom of the power hierarchy. The only way slavery would have worked was if the millions of slaves really felt powerless. Roots really did a good job showing this, with the interactions with Kunta and with the background where they showed the “masters” talking to one another about how to keep the slaves suppressed. With neo-colonialism there are trafficked people who are being forced to work to cultivate and harvest a lot of the goods we in the western world enjoy daily, from the coffee we drink to the strawberries we eat. In many of these cases products are obtained through slave labor. Just like the cotton and tobacco from the US during slavery. Goods are still grown in the US (as well as other countries under colonial rule) today under appalling conditions with trafficked people who were brought here under false pretenses or people are coerced into working. The trafficking victims of today that are slaves are one in the same as the slaves depicted in Roots. Slavery can be seen within the US prision systems in the form of convict leasing, where trafficked victims along with non violent offenders are leased out to work. In the United States we have the largest prision population in the world, this is due to several factors, part of which is the prision system is a huge enterprise. After emancipation there was a strong desire to have free labor back, this is when convict leasing really started to take shape. People would be arrested for little to no reason so they could be put into prision where they would be leased out to different businesses and farms to work off their “debt” to society. Now one needs to be put through due process, but if someone ends up in prision there is a chance they too can be leased out to work. The concept of convict leasing is legal under the 13th amendment, where slavery is acceptable as punishment for a crime. The convicts can be sent to work all over, even be sent over seas to “poor” countries to be forced to work. This is such a big business that big businesses such as target, Microsoft, Macys, and Revlon all have operations set up in prisons to force labor. Slavery is not extinct, and seeing that it has and is orchestrated by the system is important. The fact that the series Roots depicts this so throughly makes it important for the human trafficking conversation. When considering the conversation with human trafficking there is a lot that the general public doesn’t understand and the media that is out there that is supposed to depict is has many flaws. 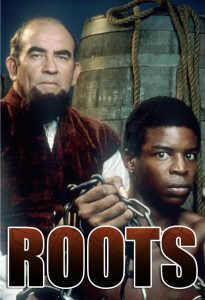 Roots was a very good depictation but it doesnt fall into the catergory of a human trafficking media, when it should. Slavery is not done away with, the system still takes part in it, and not just women are victims. Changing the conversation can be a way to change the system. See slavery for what it was, human trafficking.